The program covers all the 23 districts of Andhra Pradesh and provides aid to students whose household income is less than Rs. 6000 (US$ 140) per month. EIF promotes basic literacy with a focus on female education (70% girls) in 22 Schools located in remote villages across Andhra Pradesh. Student from Government schools/ colleges who earn90% and above and scholars from private schools/ colleges who earn over 95% on exams are recognized as GEMS OF THE NATION every year. The scholarship includes a cash award of Rs.10, 000, a merit certificate, a medal, and a gift pack. The establishment of the HYDERABAD INSTITUTE OF EXCELLENCE (HIE) is a huge leap forward in advancing our aspiration for an empowered India. Built with the vision, ‘To contribute to social reform and economic prosperity through educational excellence and to ‘produce the Leaders of Tomorrow,’ HIE is determined to shift the paradigm of education from the traditional methods of education to new ground breaking, innovative methods and modes of teaching. HIE is spread across 100 acres of land in Vikarabad, 80 Kms from Hyderabad. It is envisioned to become a world class campus with the most qualified faculty who will be entrusted to teach and guide our students. To provide focused training aimed at achieving admissions into the premier academic institutes like IIT, IIS, BITS of India among others.. 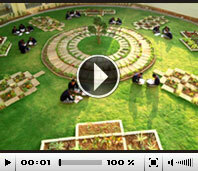 The Hyderabad Institute of Excellence is prepared to develop our young gems into self-made individuals. Work is already underway with 70 Acres of land purchased in Vikarabad. The master plan of the project; along with a computer 3D model prepared by professionals, has been completed in order to set the project on the right path from its earliest stage. The property has been protected with fencing; with excavation and landscaping work in progress. The site office has been constructed, with security personnel guarding the entire area on a 24/7 basis. This one-of-a-kind Institute is being heavily promoted through print and electronic media with news coverage and a 13 minute promotional documentary about the institute.